Gabion Baskets & Geotextiles combinations are designed by Maccaferri to protect embankments from the aftermath of heavy rains. Maccaferri is an active global force when it comes to the provision of flood mitigation and environmentally friendly embankment protection solutions. One primary product line used to mitigate flooding and erosion are Zn & PVC Coated Gabion Baskets and Geotextiles. 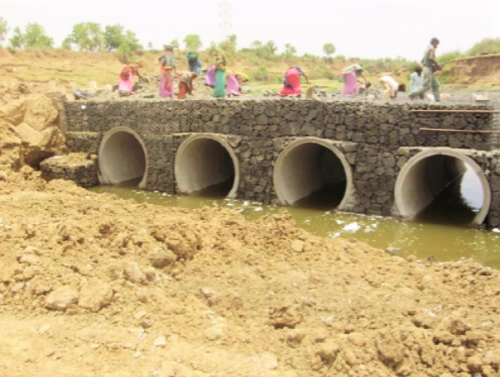 In July 2012 Maccaferri India completed an Embankment protection project in Gujarat State (India) that exemplifies aptly how Zn & PVC Coated Gabion Baskets, and Geotextile combination solutions can be applied to protect embankments from external hazards. The Dhadhar river flows through India’s Gujarat State. It originates in the Pavagadh Hills of Gujarat State and flows through both the Vadodara and Bharuch districts. The Kural—Shanpur—Sokhada raghu road was built to link two villages in Gujarat. There is an existing pipe culvert over the river Dhadhar on the approach road. The road located beyond the pipe channel was constructed overfills that were retained with the help of an RCC structure. Due to frequent floods, the RCC structure was damaged, and the approach road outside the pipe culvert was washed away, and the road link between two villages was destroyed. The villagers had to suffer throughout the year by using a long route for travel. In light of this inconvenience, the Road, and Buildings Department requested that Maccaferri India provides them with a suitable solution to address the query. Maccaferri decided that an inherently permeable and free draining structure had to be installed given the fact that the embankment in question is located in high flood zone. Maccaferri thus suggested flexible gabion retaining walls to resolve the query. Considering the heavy flood conditions and extensive discharge through the culvert, few more pipes of a higher diameter compared to the pre-existing ones, were provided. Moreover, a flexible structure, approximately 6m in height, was designed and constructed. The key highlights of the solution are as follows: The structure is flexible in nature and can hence accommodate differential settlement of foundation to a considerable extent. Also, the flexibility and modular structure of the solution permitted the construction and diversion of culverts via the retaining walls. The Also, the permeability of the work ensures dissipation of pore water pressure. Finally, the work qualifies as sustainable and also, the simplicity in construction ensures timely execution in severe condition. Currently, four years since the successful completion of the project, the structure continues to efficiently protect the embankment, even after multiple instances of heavy monsoon rains. For more technical details, please download the Case History.